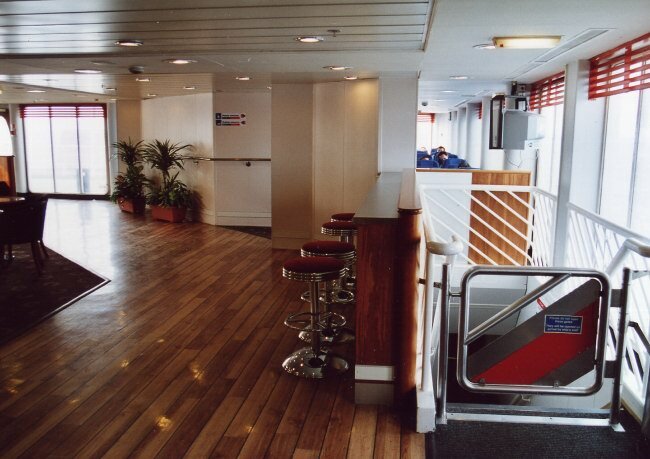 Above: Foot passengers enter the ship via the car deck astern, although as when the ship sailed from Dover, their first impressions of the passengers spaces are of the aft Silverstones Sports Bar. 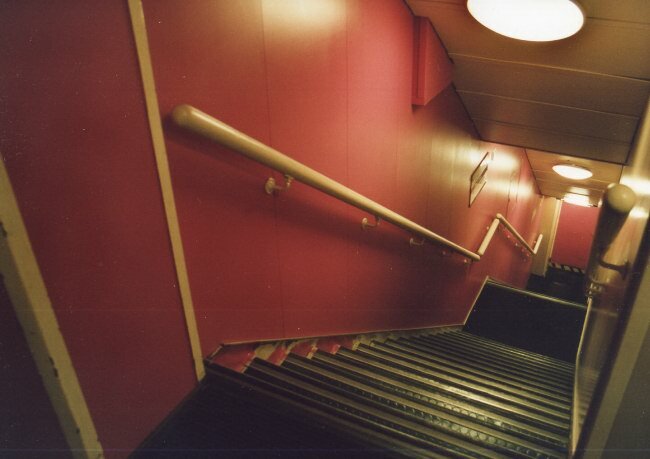 The staircases leading up from the car decks are entirely unchanged from the ship's Dover incarnations - this is the red stairway, located amidships. Above and below: The main change to Silverstones has been the appropriation of the aft corners on either side for use as small reclining seat lounges. 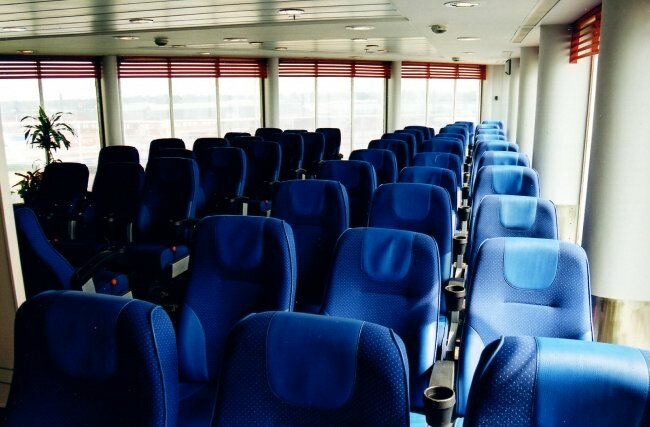 These seats were moved during the Polferries refit from their previous location in the vast lounge created by GA Ferries in the former Duty Free shop; with the latter now the site of more cabins, some of the seats have been re-installed here in Silverstones, whilst others have found their way aboard Polish fleetmate Scandinavia (ex-Visby, Stena Felicity) to replace worn-out seating on that ship. Above: An overall view looking forward of Silverstones. 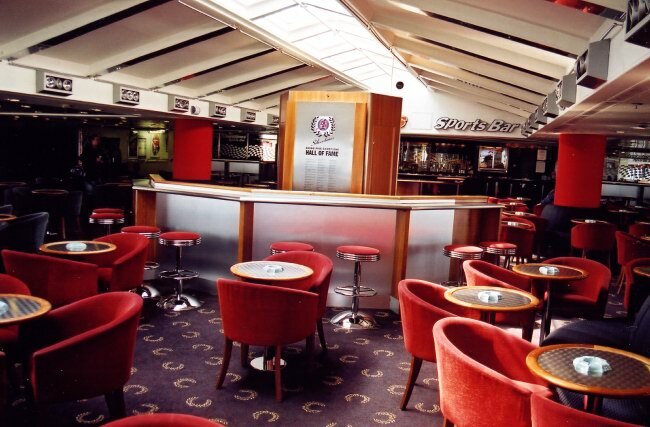 Originally the Samba Bar, this is largely unchanged in the centre section from its latter P&O Stena incarnation, although the sports car previously hanging from the deckhead beneath the skylight was removed prior to sale to GA Ferries. 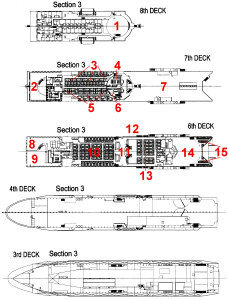 Above: Looking aft on the port side in Silverstones, showing how the reclining seat areas have been fairly neatly partitioned off from the rest of the bar. Although the space thus created is satisfactorily spared the worst of the noise from the bar itself, the location is hardly ideal being directly above the engines and, when the ship is manoeuvring in port, the site of some notorious and for the unaware quite disturbing noise and vibrations. 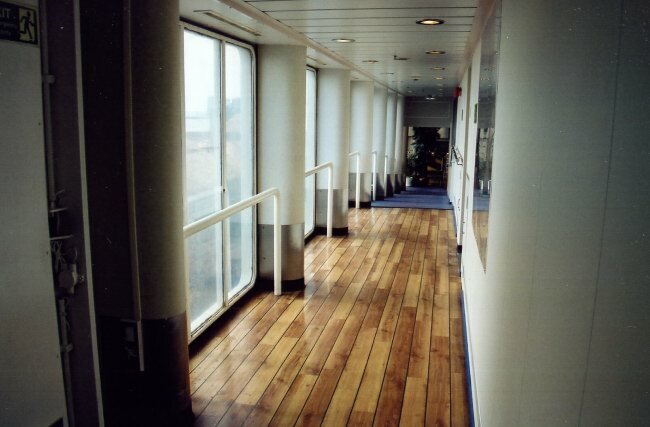 Above: Heading forward along the port side arcade leading from Silverstones aft to the main lobby amidships. 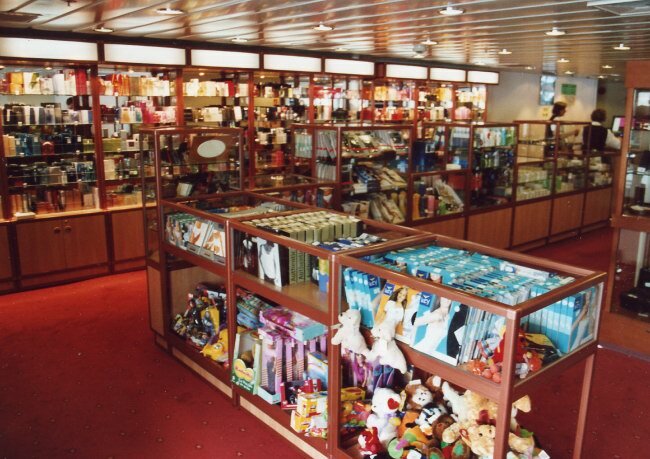 Inboard of this was previously the large duty free shop, now converted to cabins by Polferries with just a small shop being retained at the forward end. Above: Inside the remaining shop located just aft of the main lobby (accessed as in the ship's Cross-Channel career from the lower part of the grand staircase). 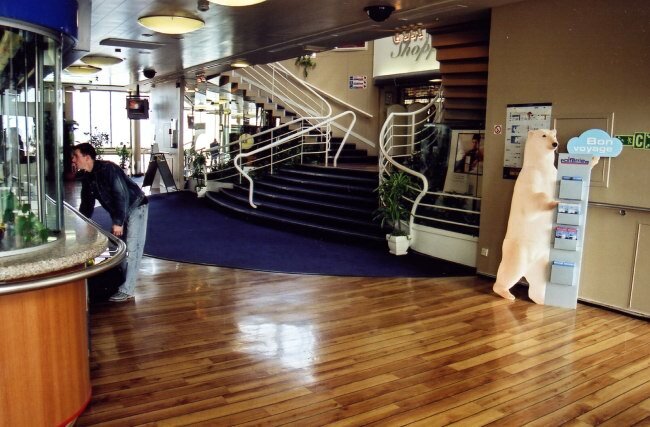 Above: Looking aft and across to starboard in the main lobby - this area is relatively unchanged in structure from the ship's Fantasia debut in 1990 whilst the decor (promotional Polar Bears apart) is P&O Stena. The grand staircase can be seen leading initially up to the small residual shopping centre before dramatically sweeping off on either side up to the upper lobby. Above: An alternative view of the lobby, looking across to port with the information (nearest to the camera) and the bureau de change counters. 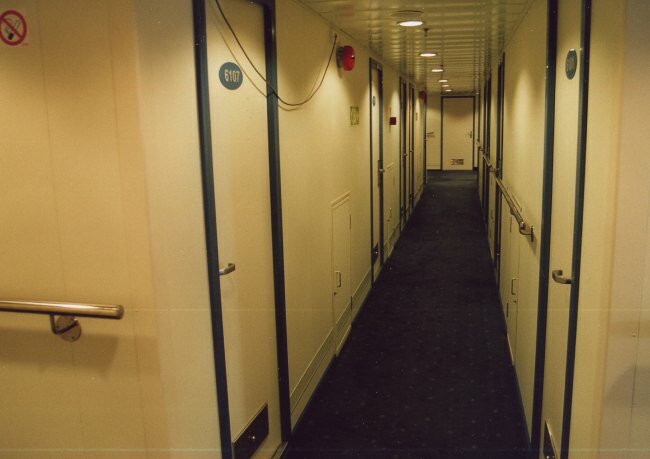 The extra deck height in this space created when the ship was originally conceived as Fantasia is evident. 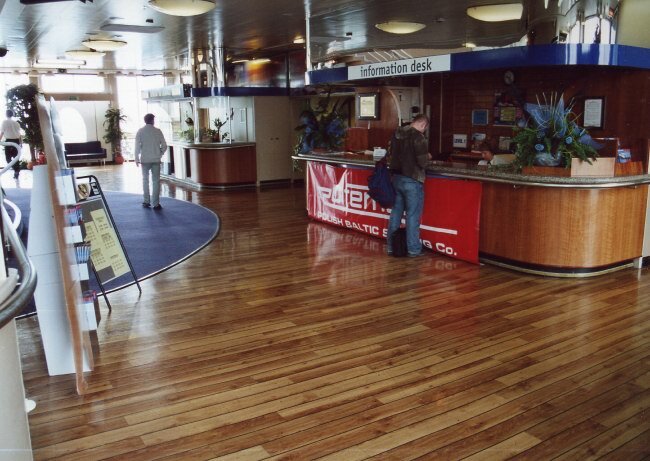 Above: Once the Speedy Gourmet and latterly the International Food Court (IFC), the amidships section once occupied by the ship's vast self-service restaurant has now been given over entirely to new cabin accommodation installed during the pre-Polferries refit. 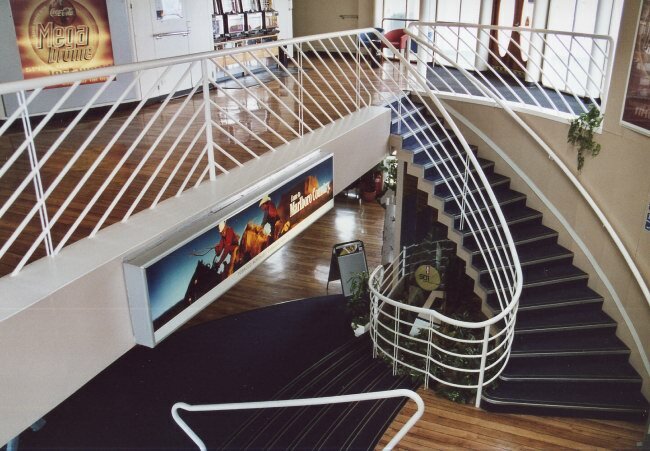 Above: A view of Warren Platner's epic staircase linking the upper and lower amidships lobbies. 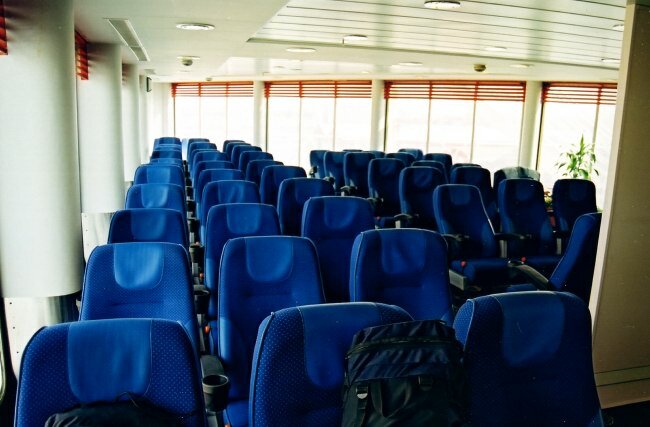 On the upper level can be seen a P&O Stena poster quaintly promoting the Coca Cola Mega Drome - the video games have long gone however with the space converted to a reclining seat lounge by GA Ferries in 2004 and then to a conference room by Polferries. 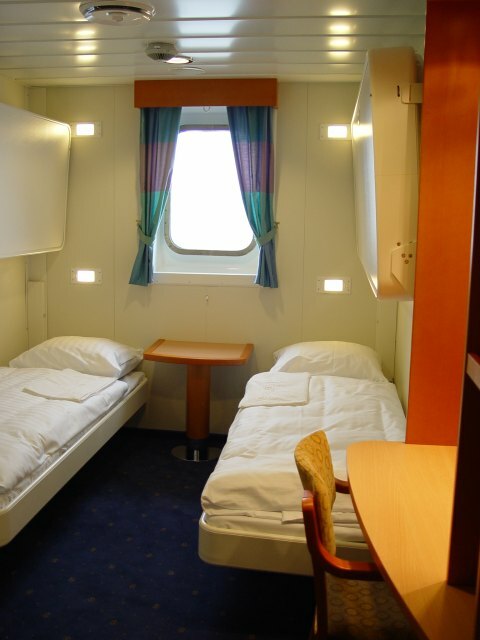 Above and below: Two views of one of the new cabins installed by Polferries, in this case an outside cabin. 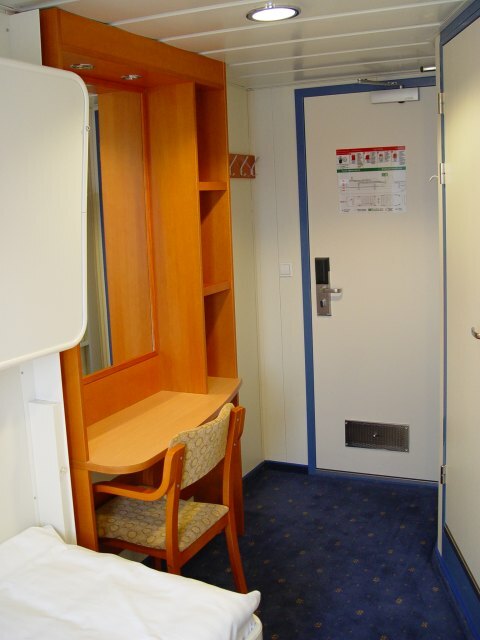 Larger De Luxe cabins are also available in some of the former crew quarters on the decks above.